Officials say the illegal operation included 89 marijuana plants, many that resembled trees and stood more than 12 feet tall. A man has been arrested in connection with 89 marijuana plants found Wednesday morning within the Loma Fire area in the Santa Cruz Mountains, after flames exposed the illegal grow in the charred landscape, a Santa Clara County sheriff's spokesman said. The Sheriff's Office's Marijuana Eradication Team served a search warrant for an illegal marijuana grow around 8:30 a.m. at a rural property near Loma Chiquita and Loma Prieta roads, sheriff's Sgt. Richard Glennon said. The suspect has since been identified as Yariv Dorr, who has been booked into jail and charged with two safety code violations, sheriff's officials said. The Loma Fire started Sept. 26 not far from where the raid took place in the southern section of the county. 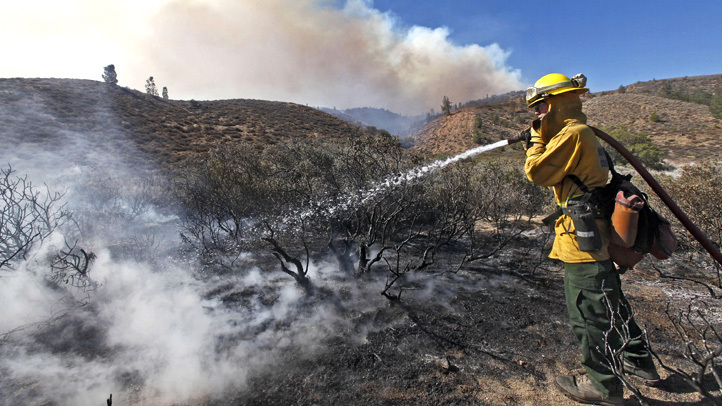 It had burned through 4,474 acres and was 94 percent contained as of Wednesday morning, Cal Fire officials said. Deputies arrested Dorr in connection with the grow operation that included marijuana plants that resembled trees, with many standing at more than 12 feet. One weighed 44 pounds, Glennon said, but the haul still needs to be weighed before a street value can be calculated. The site is close to where the fire began, but there's no indication that the grow is related to the cause of the fire, Glennon said. Officials, however, are concerned about marijuana grows and fire danger. Multiple greenhouses were found on the property, but some were destroyed in the fire, according to Glennon. Deputies have been able to gain more knowledge of the area as firefighters continued to battle the blaze and law enforcement officials conducted evacuations, he said. "Due to the Loma Fire, a lot of foliage has been burned away, greenhouses have been exposed," Glennon said. "So we've been stepping up our investigation efforts in this area for marijuana eradication." Personnel from the county's Office of Code Enforcement, state Department of Fish and Wildlife and Cal Fire also went to the grow site on Wednesday to look into other alleged violations, Glennon said. Dorr's neighbor described him as a "good person" on Wednesday, but also said he will be glad when many of the other marijuana grows get shut down. With their makeshift power supplies, the grows have caused several fires in the area in the past, according to Jim Yingling. "You can't make one mistake up here," he stressed. "You make one mistake and big bad things happen, and that's what has happened here multiple times ... You just have to be very safe." The sheriff's office denied that the raid was in response to complaints by residents that there should have been more raids before the Loma Fire sparked. It did acknowledge, however, that more such operations can be expected in the future. A dozen homes and 16 outbuildings have been destroyed by the Loma Fire, which has also damaged one residence and at one point threatened hundreds of other homes, Cal Fire officials said. Roughly five firefighters were treated for minor injuries since the blaze began, according to Cal Fire. The cause of the fire is under investigation. Evacuations orders were lifted Tuesday morning in Santa Clara County and last week in Santa Cruz County, according to sheriff's officials. There were 716 firefighters sent to battle the fire. It is expected to reach full containment by Saturday, according to Cal Fire. In the coming weeks, crews expect to stay at the scene to mop up, patrol and remove their equipment. Those who would like to donate food or goods to people affected by the fire can send them to The Salvation Army in Gilroy and Santa Cruz or Second Harvest Food Bank in Watsonville. Monetary donations can be made through the American Red Cross. Anyone with information on the grow or others in the county has been asked to call the Marijuana Eradication Team at (408) 808-4420.